It has been too long since my last post. So much has been going on. You know life just gets in the way. Even though I am self employed, people do not realize all that it takes. So sometimes the studio and art making just does not happen. But the Jewish New Year landed this year on my 55th birthday. So I took it as a sign of new beginnings. I enrolled in a leadership program (as if I have the time), I am trying to cut back my work hours (I sometimes work from 9am-8pm without a break- I own a skincare studio) and I think I found a direction in my artwork that is working for me. I like the concept of having smoothness, which is very common in encaustic, but with texture, also very common in encaustic. I usually see artists who scrape the work to the smoothest finish, and others who have texture and unevenness all over. I am trying to create “smooth texture”. So they are both, well sort of. 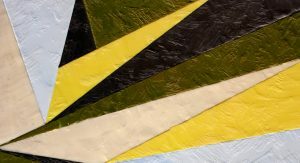 When I was working on my triangle paintings I would put the wax on with a small brush- so I could see the brush strokes in the wax, yet I would let it cool and then scrape it back, so you could still see the strokes, but upon touch, it was smooth. Not completely smooth, but smooth enough. Well also for the new year, i hope to write more about my work. That is if I can figure it out.